Join us at Book Culture on 112th Street on Monday, March 11th at 7pm for a book event that’s as much rock show as lecture with University of North Carolina at Chapel Hill English Professor, writer, and musician Florence Dore and her husband, musician Will Rigby, along with rock novelist Rick Moody. Celebrate the release of Dore’s Novel Sounds: Southern Fiction in the Age of Rock and Roll with remarks on rock and literature by Dore and Moody, and a performance by Will Rigby and the Novel Sounds—featuring Peter Holsapple . Various singers will contribute, including Florence and Rick. The 1950s witnessed both the birth of both rock and roll and the creation of Southern literature as we know it. Around the time that Chuck Berry and Elvis Presley put their electric spin on Southern vernacular ballads, a canonical group of white American authors native to rock's birthplace began to write fiction about the electrification of those ballads, translating into literary form key cultural changes that gave rise to the infectious music coming out of their region. 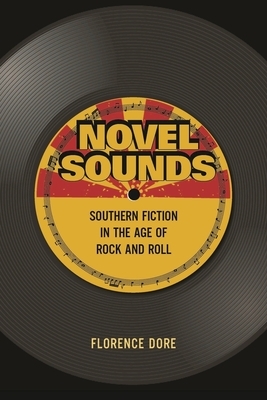 In Novel Sounds, Florence Dore tells the story of how these forms of expression became intertwined and shows how Southern writers turned to rock music and its technologies--tape, radio, vinyl--to develop the "rock novel." Dore considers the work of Southern writers like William Faulkner, Flannery O'Connor, and William Styron alongside the music of Bessie Smith, Lead Belly, and Bob Dylan to uncover deep historical links between rock and Southern literature. Along with rock pioneers, Southern authors drew from blues, country, jazz, and other forms to create a new brand of realism that redefined the Southern vernacular as global, electric, and notably white. Resurrecting this Southern literary tradition at the birth of rock, Dore clarifies the surprising but unmistakable influence of rock and roll on the American novel. Along the way, she explains how literature came to resemble rock and roll, an anti-institutional art form if there ever was one, at the very moment academics claimed literature for the institution. Florence Dore is a professor of English at the University of North Carolina, Chapel Hill. She is the author of Novel Sounds: Southern Fiction in the Age of Rock and Roll (Columbia University Press 2018), and she released her album Perfect City (Slewfoot Records) in 2001. Dore has published writing on the blues, the rock novel, and her first book on literary censorship came out on Stanford University Press in 2001. She is a member of the board of the Institute for Bob Dylan Studies at University of Tulsa’s Bob Dylan Archive and has organized two major public conferences on rock and literature: at the National Humanities Center and Carolina Performing Arts in 2016-2017; and at the Rock and Roll Hall of Fame in 2011. She worked with Eric Ambel (Joan Jett, The Del-Lords, Steve Earle) and Dennis Diken (The Smithereens) to make Perfect City, and has toured with many notable artists including Dan Baird (Georgia Satellites), Ken Coomer (Wilco), and Dave Jacques (John Prine). Her song Christmas was recorded by the Posies for the 1996 Geffen Records release Just Say Noel. Rick Moody is the author of six novels, including, THE ICE STORM and HOTELS OF NORTH AMERICA; three collections of stories; and three works of non-fiction, including ON CELESTIAL MUSIC, and the forthcoming memoir THE LONG ACCOMPLISHMENT. He writes regularly on music at The Rumpus and elsewhere, and has released six albums, three with The Wingdale Community Singers, and, most recently, a jazz/noise album entitled The Unspeakable Practices. He teaches at Brown University.